CONTEXT: Rapid detection of pathogens in infected body fluids will help in establishing an aetiological diagnosis, thereby facilitating specific therapy. Molecular methods have an advantage over conventional bacteriological techniques in particularly identifying slow-growing, fastidious or non-cultivable organisms. AIM: The aim of this study is to evaluate the use of 16S rRNA polymerase chain reaction (PCR) for detecting bacterial pathogens in body fluids and compare with conventional culture methods. SETTINGS AND DESIGN: This study was done at the Clinical Laboratory of the Department of Microbiology. This was a cross-sectional study design. MATERIALS AND METHODS: A total of 100 consecutive samples which included synovial fluid, cerebrospinal fluid, ascitic fluid and pleural fluid received in the laboratory during the study period were subjected to PCR for 16S rRNA using specific primers and conventional culture by standard protocol. Samples which were positive for 16S rRNA were sequenced to identify the organism. Results of sequenced products were compared in terms of number of organisms, with culture isolates. RESULTS: The detection rate of 16S rRNA PCR was at 13% as compared to culture at 3% (P = 0.0009). The diagnostic sensitivity and specificity of the PCR were 100% and 89.7%, respectively. The concordance of PCR and culture for both identical positive and negative samples was 90%. CONCLUSIONS: The 16S rRNA PCR proved to be rapid method for detection of bacterial pathogens in body fluids. It may be a valuable tool in the diagnostic armamentarium for differentiating bacterial infection from others and starting empiric treatment. Several rapid methods for disease detection have evolved over time. Delay in identification of the causative agent is a diagnostic dilemma faced in many life-threatening infections. Conventional diagnosis of bacterial infection is time-consuming as it has to go through several stages including culture and phenotypic identification requiring minimum of 24 h of incubation. Sometimes, the disease remains undetected due to slow-growing organisms or non-cultivable nature of the organism. Rapid detection of pathogens in clinical samples will help accurate treatment. Molecular methods of detection are proving to bridge some of these gaps. Targeting conserved regions of microbial genomes, particularly the 16S rRNA of bacteria by polymerase chain reaction (PCR), combined with sequence analysis of the products is a novel approach to rapid detection of pathogens from clinical samples. 16S rRNA is a broad-range bacterial genome which is targeted directly from the clinical specimen. Subsequent sequencing of the PCR product and using nucleotide Basic Local Alignment Search Tool (BLAST) to compare with the data available in the gene bank has increased the spectrum for identification of pathogens. This technology has been used in the diagnosis of sepsis, endocarditis, meningitis, arthritis, pleural effusion and bone and joint infections.,,,,, The protocol for 16S rRNA gene PCR in routine diagnostic workflow is rapid and simple. We aimed to evaluate the use of 16S rRNA PCR for detecting bacterial pathogens in infected body fluids and compare with conventional culture method. The study was cleared by the Institute Ethics Committee (IEC-RC/14/110) and a waiver of consent was obtained as the study did not involve human participants and the tests were performed on samples received in the laboratory for conventional culture. This was a cross-sectional study conducted between January and December 2015 in the Department of Microbiology. A convenient sampling of 100 consecutive body fluids sent for bacterial culture was included. Samples tested included synovial fluid, cerebrospinal fluid (CSF), ascitic fluid and pleural fluid. These were aseptically aliquoted into two fractions, one each for culture and 16S rRNA. Conventional culture was done as per standard microbiological protocols. All samples were stored at −20°C for 16S rRNA PCR. Following centrifugation of the second aliquot, DNA was extracted using an extraction kit, QIAamp DNA mini kit (Qiagen), according to the manufacturer's instructions. Amplification of 5 μl of the extracted DNA along with positive control (Escherichia coli ATCC 25922) and negative control (distilled water) was done with 0.5-mM specific primers as mentioned in [Table 1] adapted from Woo et al., 200 mM of each dNTP, 10 mM KCl, PCR buffer, 1.5 mM MgCl2 and 1.0 U Taq polymerase (Ampliqon). Amplification conditions for PCRs were as follows: Five minutes at 94°C to denature the DNA, followed by 40 cycles of denaturation at 94°C for one minute, primer annealing at 62°C for one minute and strand extension at 72°C for two minutes on an Eppendorf thermal cycler. PCR products were subjected to gel electrophoresis on a 1.5% agarose gel with ethidium bromide, and DNA bands were visualised. This procedure took around four hours. Those samples which were found to be positive for 16S rRNA at 1343-bp band were further sequenced (Eurofins Private Limited, Bengaluru, Karnataka, India). Purified amplicons were sequenced in Applied Biosystems in the forward and reverse direction in separate reactions and in duplicate. Organisms were identified by nucleotide BLAST comparing sequences to a database library of known 16S rRNA gene sequences in GenBank (http://www.ncbi.nlm.nih.gov/blast/Blast.cgi) by multiple sequence alignment. The bacterial source of the sequence was identified by matching it with a sequence with the highest maximum identity score from the GenBank database. Results of the molecular method were compared with the conventional culture. Comparison of 16S rRNA PCR and culture for detection of pathogens was performed using the McNemar's test for significance. P < 0.05 (two-tailed) was considered significant. Sensitivity and specificity of culture and 16S rRNA were determined using IBM SPSS Statistics for Windows, Version 22.0. Armonk, NY: IBM Corp. Samples positive by culture were 3 (3%), while bacterial 16S rRNA was amplified in 13 of the 100 (13%) samples tested by the 1343-bp PCR protocol [Table 2]. Maximum score, total score and E value and percentage of identification for each of the positive cases by PCR are described in [Table 3]. Ninety samples yielded concordant results in culture and PCR. Three samples had identical positive results such as E. coli from ascitic fluid, Streptococcus pneumoniae from CSF and Staphylococcus aureus from pleural fluid. Eighty-seven samples were negative by both culture and PCR methods. A concordance of PCR and culture for both identical positive and negative samples was (3 + 87)/100, i.e. 90%. PCR was positive in 13 samples. 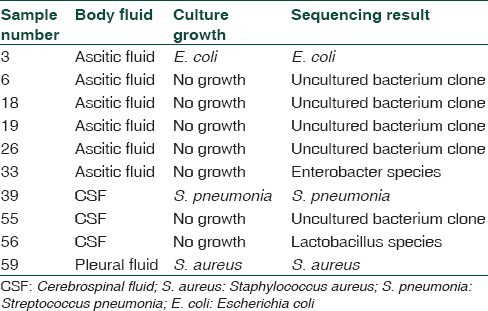 Uncultured bacterial clones were identified in four ascitic fluid and one CSF sample; enterobacter species were found in one ascitic fluid sample. One of the CSF samples had lactobacillus spp. [Table 4]. Three samples (2 – CSF and 1 – ascitic fluid) were positive for 16S rRNA but could not be sequenced. None of the samples were positive by culture but negative by PCR. The detection rate of 16S rRNA PCR (13%) was higher than that of culture (3%) (P = 0.0009). Compared to culture, the diagnostic sensitivity and specificity of the PCR were 100% and 89.7%, respectively. Culture is a definitive diagnostic criterion often referred to as the gold standard. However, in practice, it is often inconclusive due to several factors, low bacterial load, prior antibiotic treatment and fastidious or non-cultivable nature of the organism. Molecular detection methods have overcome some of these lacunae. Detection of a pan-bacterial genome component, the 16S rRNA by PCR has increased the detection of bacterial pathogen. In the present study on body fluids, the 16S rRNA was detected in 13% of the specimens compared to 3% by culture. This was comparable to Grif et al., who found that among 47 synovial fluid specimens, 3 (6.4%) were positive by culture and 9 (19.1%) were positive by PCR. Similar results have also been reported by Akram et al., suggesting that PCR assay is useful for the early diagnosis of bacterial infections. Several factors could contribute to the superiority of a molecular detection method over conventional culture. Besides factors mentioned earlier, compromised viability of fastidious organisms during transport and quality of media and culture conditions, may also be contributing factors. Mere detection of the 16S rRNA may be helpful in narrowing down the aetiology to bacterial and non-bacterial which may help in initiating empiric therapy. As a logical follow-up, sequencing of the PCR product must be done, it plays a vital role in the accurate identification of bacterial isolates. This will help in targeting specific antibiotic therapy. However, the uncultured bacterial clone proved difficult to interpret due to their unique genome which did not match the known genomes in the data bank. From clinical perspective, this could pose a challenge in initiating targeted empiric therapy Literature shows several instances of uncultured bacterial clones found in the environment. Human isolates have still remained unidentified. Lactobacillus spp. causing meningitis, a rare case, could be a pathogen. A major limitation of the molecular technique is the absence of an antibiotic susceptibility testing, unless resistance genes are detected simultaneously. This is offset by the rapidity of establishing an aetiological diagnosis. Newer automated culture methods with rapid identification systems including antibiotic susceptibility testing have improved the turnaround time for diagnosis. Detection of 16S rRNA is an improvement on decreasing the time from collection to report. However, despite encouraging results, 16S rRNA detection and sequencing in clinical microbiology laboratories requires improved guidelines for interpretation of results. Another major drawback is the need for additional/supplementary methods for bacterial species which cannot be identified confidently by 16S rRNA sequencing alone. The cost of molecular tests has come down with increasing use of these tests in diagnostic laboratories, yet they are much higher than conventional culture. Even as our results were promising, we have not done a cost evaluation to assess its utility as a routine test, which is a limitation of the present study. Further studies are needed to improve its sensitivity and evaluate its feasibility and cost-effectiveness. The 16S rRNA gene sequencing appears to be a novel tool for diagnosing infections from body fluids. The major advantage over conventional culture is its ability to detect and identify cultivable, non-cultivable and non-viable bacteria. Even though 16S rRNA detection in body fluids appears promising, it needs to be further evaluated before it can be widely used in clinical diagnostic laboratory. Rampini SK, Bloemberg GV, Keller PM, Büchler AC, Dollenmaier G, Speck RF, et al. Broad-range 16S rRNA gene polymerase chain reaction for diagnosis of culture-negative bacterial infections. Clin Infect Dis 2011;53:1245-51. Lu JJ, Perng CL, Lee SY, Wan CC. Use of PCR with universal primers and restriction endonuclease digestions for detection and identification of common bacterial pathogens in cerebrospinal fluid. J Clin Microbiol 2000;38:2076-80. Grif K, Heller I, Prodinger WM, Lechleitner K, Lass-Flörl C, Orth D, et al. Improvement of detection of bacterial pathogens in normally sterile body sites with a focus on orthopedic samples by use of a commercial 16S rRNA broad-range PCR and sequence analysis. J Clin Microbiol 2012;50:2250-4. Clarridge JE 3rd. Impact of 16S rRNA gene sequence analysis for identification of bacteria on clinical microbiology and infectious diseases. Clin Microbiol Rev 2004;17:840-62. Drancourt M, Bollet C, Carlioz A, Martelin R, Gayral JP, Raoult D. 16S ribosomal DNA sequence analysis of a large collection of environmental and clinical unidentifiable bacterial isolates. J Clin Microbiol 2000;38:3623-30. Bosshard PP, Abels S, Zbinden R, Böttger EC, Altwegg M. Ribosomal DNA sequencing for identification of aerobic gram-positive rods in the clinical laboratory (an 18-month evaluation). J Clin Microbiol 2003;41:4134-40. Bosshard PP, Abels S, Altwegg M, Böttger EC, Zbinden R. Comparison of conventional and molecular methods for identification of aerobic catalase-negative gram-positive cocci in the clinical laboratory. J Clin Microbiol 2004;42:2065-73. Zbinden A, Böttger EC, Bosshard PP, Zbinden R. Evaluation of the colorimetric VITEK 2 card for identification of gram-negative nonfermentative rods: Comparison to 16S rRNA gene sequencing. J Clin Microbiol 2007;45:2270-3. Woo PC, Lau SK, Teng JL, Tse H, Yuen KY. Then and now: Use of 16S rDNA gene sequencing for bacterial identification and discovery of novel bacteria in clinical microbiology laboratories. Clin Microbiol Infect 2008;14:908-34. Tille PM. Bailey & Scott's Diagnostic Microbiology. 13th ed. St. Louis, Missouri: Elsevier; 2014. Woo PC, Cheung EY, Leung K, Yuen K. Identification by 16S ribosomal RNA gene sequencing of an Enterobacteriaceae species with ambiguous biochemical profile from a renal transplant recipient. Diagn Microbiol Infect Dis 2001;39:85-93. Akram A, Maley M, Gosbell I, Nguyen T, Chavada R. Utility of 16S rRNA PCR performed on clinical specimens in patient management. Int J Infect Dis 2017;57:144-9. Schuurman T, de Boer RF, Kooistra-Smid AM, van Zwet AA. Prospective study of use of PCR amplification and sequencing of 16S ribosomal DNA from cerebrospinal fluid for diagnosis of bacterial meningitis in a clinical setting. J Clin Microbiol 2004;42:734-40. Rantakokko-Jalava K, Nikkari S, Jalava J, Eerola E, Skurnik M, Meurman O, et al. Direct amplification of rRNA genes in diagnosis of bacterial infections. J Clin Microbiol 2000;38:32-9. Robin F, Paillard C, Marchandin H, Demeocq F, Bonnet R, Hennequin C, et al. Lactobacillus rhamnosus meningitis following recurrent episodes of bacteremia in a child undergoing allogeneic hematopoietic stem cell transplantation. J Clin Microbiol 2010;48:4317-9.